The Santa Barbara International Orchid Show is proud to host local, regional and international participants. Click Here for a list. The 44th Annual Cymbidium Congress will be held in conjunction with SBIOS on Saturday, March 16, 2019, by the Cymbidium Society of America. Register for a day of lectures by experts from around the world at the CSA website. Speakers include Carol Butcher (New York), Dr. Ken Cameron (Wisconsin), Wenqing Perner (China), Dr. Randall Robinson (Australia) and Dave Sorokowsky (California). Download the 2019 Cymbidium Congress Brochure for more information. The Santa Barbara Art Association manages a juried exhibition of orchid-themed fine art and photography showcasing the work of local and regional artists. Local floral artisans create unique, themed floral arrangements and corsages using orchid blooms in a popular display area managed by Las Floralias. 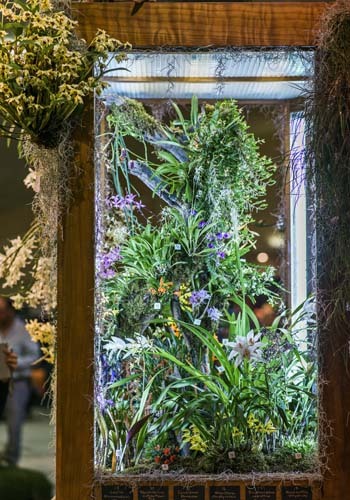 Visit one of the Orchid Show’s regular demonstration workshops. Orchid experts, including members of the UCCE Master Gardeners program, will lead workshops on raising healthy orchids. Leading growers will offer growing tips and provide common sense advice on a variety of culture topics. Do you have a question about growing your orchid? Bruce Kidd will be available daily in the Earl Warren Exhibit Hall throughout the show weekend to answer your orchid questions. Bruce Kidd is a past president of the San Diego County Cymbidium Society and an avid orchid enthusiast who currently grows about 500 temperamental orchids in greenhouses and outdoors. Want to see the Show in a more intimate event? Buy tickets for Orchids After Dark! Sign up for a little Orchid Magic and receive periodic e-newsletters with Show updates, plus fun facts and enticing photos from the enchanting world of orchids! The Santa Barbara International Orchid Show never sells its mailing list. 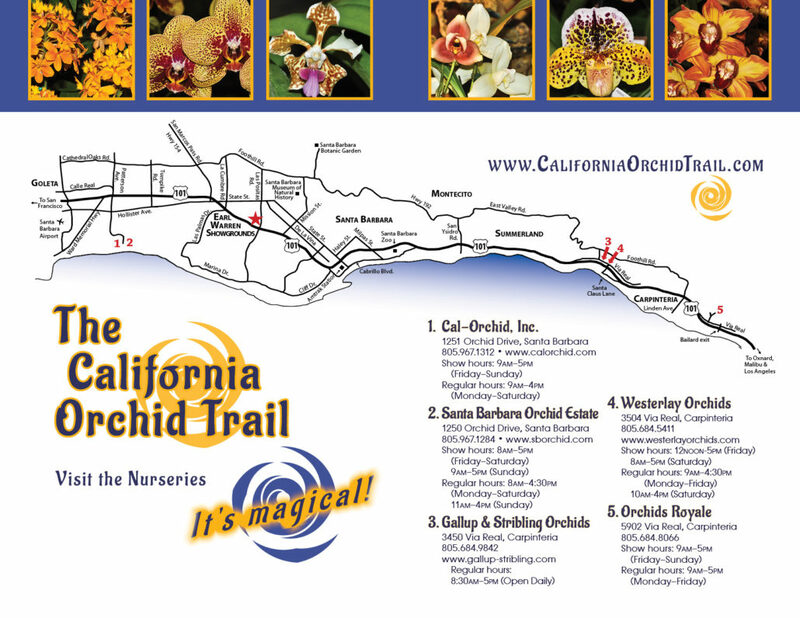 Visit the California Orchid Trail for information on local exhibitors and vendors holding nursery open houses during the Show. Or download the California Orchid Trail Map for locations.